I’m really excited about Halloween this year. Bean is into anything “spoooooooky” lately so we’ve been having a lot of fun preparing for the big day. Since she’s only three years old, her idea of spooky is relatively tame so I’ve been sticking to pumpkins, jack-o-lanterns, and black cats. 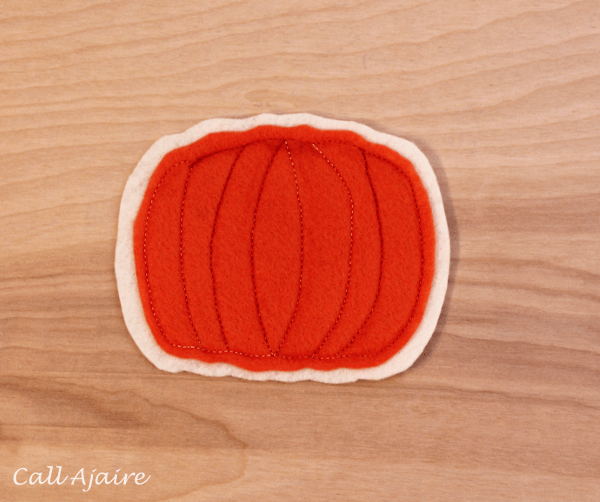 The template has an inner pumpkin shape (the smaller one), an outer pumpkin shape (the larger), and lines you can use as a guide for stitching the coaster together and adding some detail to the pumpkins. 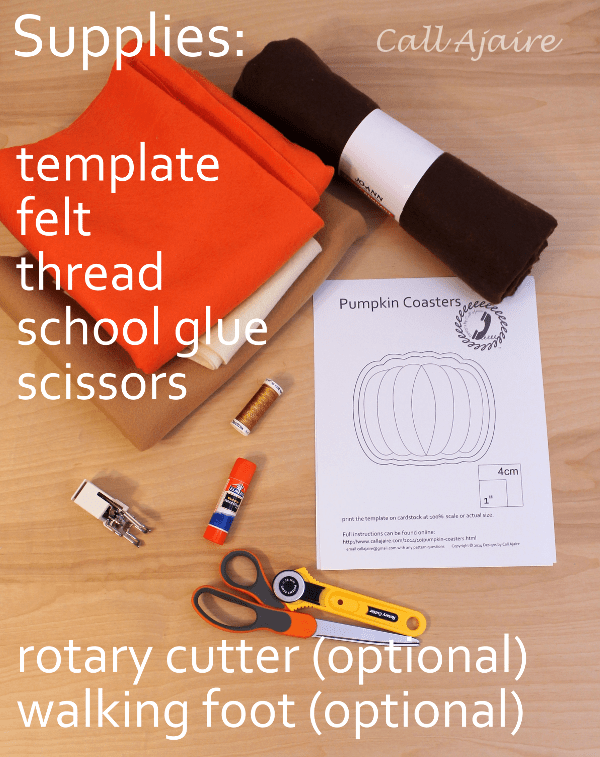 I recommend printing the template twice and cutting one shape as the outer and one as the inner pumpkin. 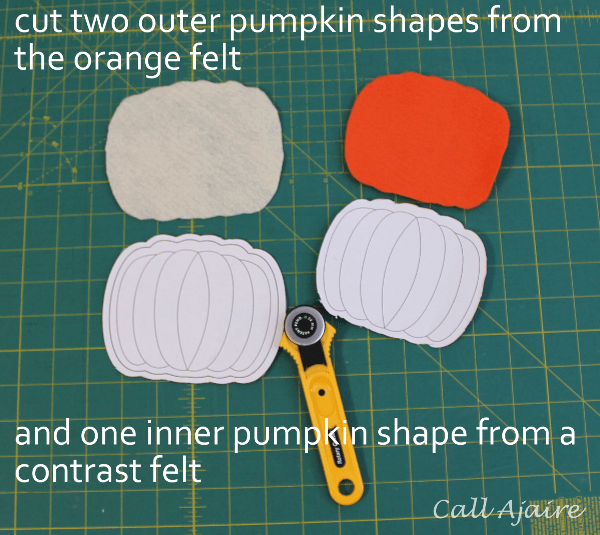 However, if you’d like to conserve paper, then cut out all the inner pumpkins (accent fabrics) first and then cut out the outer (orange) ones. 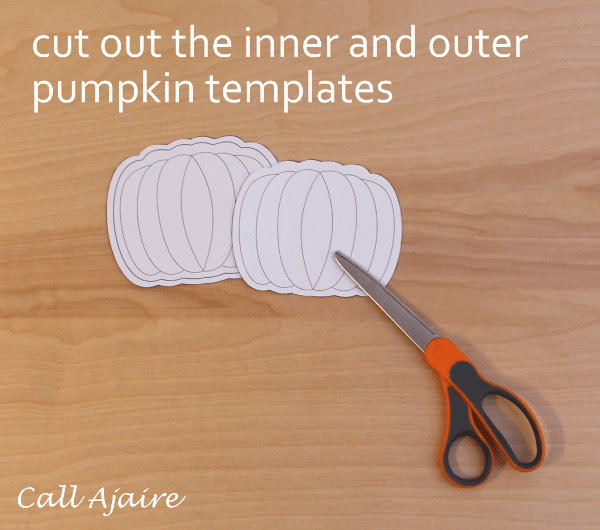 Using the templates, cut out two orange outer pumpkin shapes and one inner accent shape. 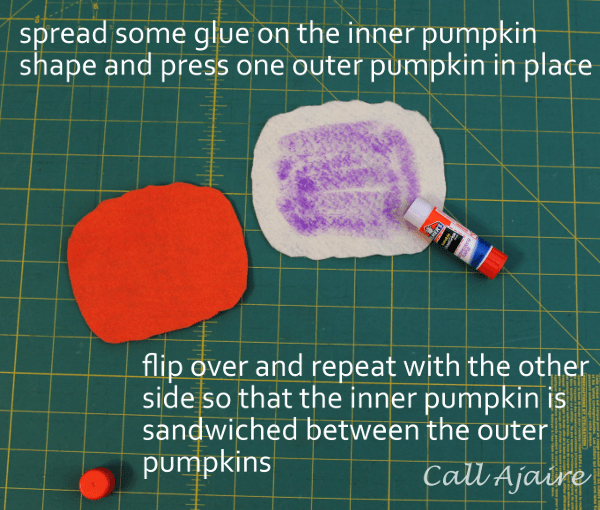 School glue will temporarily hold the shapes together and keep the inner accent pumpkin sandwiched between the two outer orange pumpkins. To speed the drying of the glue you can press carefully with the wool setting of your iron. 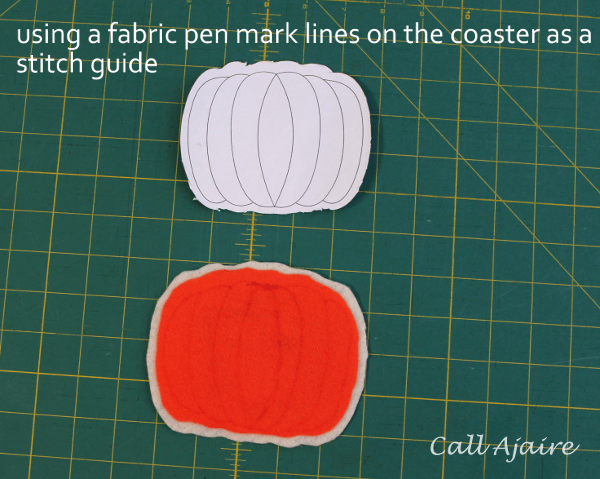 If you want to use the lines on the template, trace with a disappearing fabric pen. 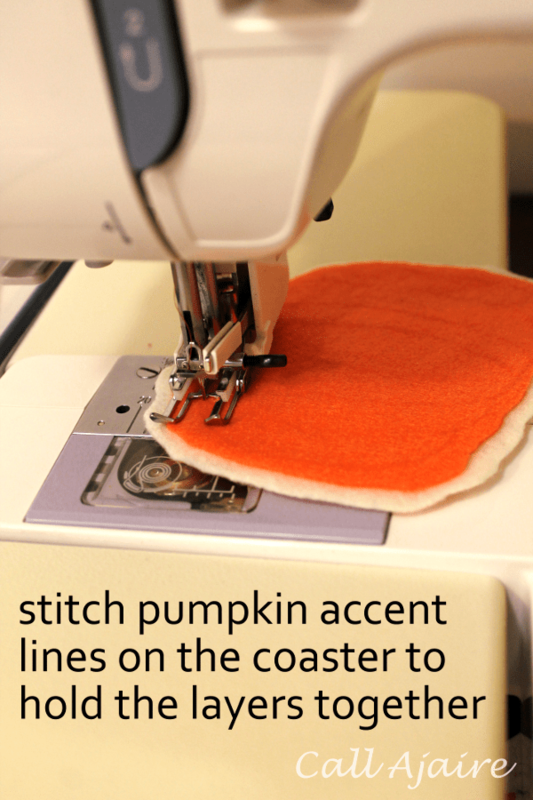 This is also a place where you could free form and make the pumpkins your own. After all nature doesn’t always follow a pattern, right? I prefer to use the walking foot attachment on my machine so I can be sure the layers won’t shift while I’m sewing the lines I traced, but if you don’t have one don’t worry: the glue should have been enough to hold everything together. Trim up the threads and your coaster is complete. See how quick and easy that was? Now go and make a bunch more, hehe. But seriously, I made some similar felt coasters about six or so years ago and they are still in use. 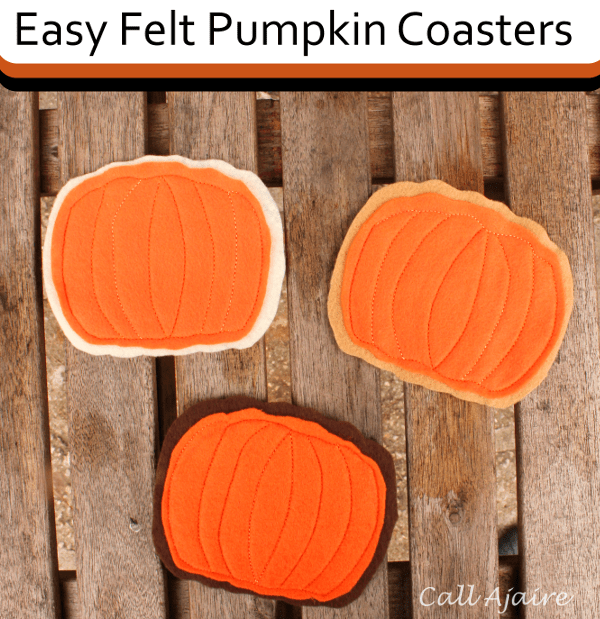 These guys hold up really well and are a fun way to add some decor for the holiday. For more inspiration you should head over to the Halloween sharing hub and if you’re making something fun for Halloween this year use the hashtag #DIY4Halloween to share on social media. I’d love to see what you’re making! Ooooh I didn't realize they are reversible. Nice touch! !